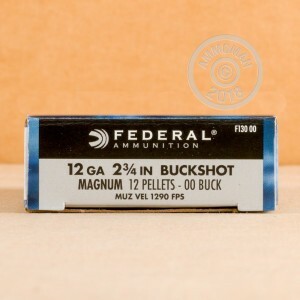 This 12 gauge shotshell ammunition from Federal is a great choice for hunting midsize game such as deer or hogs. 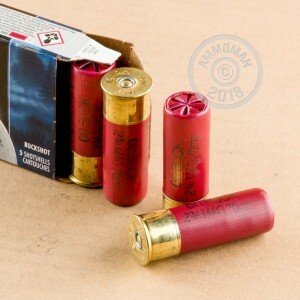 Each 2-3/4" shell in this box of 5 fires a 9-pellet column of 00 buckshot at a muzzle velocity of 1,290 feet per second. This is a full power load that produces nice tight patterns, strong terminal ballistics, and relatively heavy recoil. Federal shotshells are loaded in Anoka, Minnesota. The Power-Shok series is a complete line of ammunition geared toward hunters who want good performance at a reasonable cost.